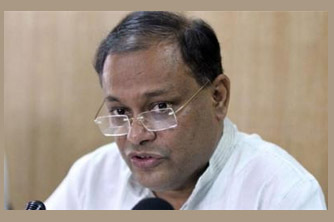 Observing that Jatiya Oikya Front leader Dr Kamal Hossain’s demand for holding a dialogue for fresh polls is a ridiculous one, Information Minister Dr Hasan Mahmud on Saturday said the jurist is now talking about ‘so-called dialogue’ to hide their election debacle. “The country’s people are not foolish. How they can forget the BNP-Jamaat’s mayhem like burning people alive through arson attacks…how does BNP win in polls by killing people and vandalising public property?” he questioned at a discussion in city this morning. Bangabandhu Sangskritik Jote (BSJ) organised the discussion at Jatiya Press Club, marking the Homecoming Day of Father of the Nation Bangabandhu Sheikh Mujibur Rahman. He said BNP and their allies are now demanding ‘so-called dialogue’ for a fresh election, which is really ridiculous one. “How can a party win in an election after doing nomination trade? They gave nominations to 800 aspirants in 300 constituencies through nomination trade. The country’s people have given them a befitting reply,” he said. “I urge them (BNP) to analyse the reasons behind their defeat in the last parliamentary election and change the party’s leadership,” Mahmud said. After his (Bangabandhu) return, the information minister said, the great leader devoted himself to serve common people. “But, Bangabandhu was killed brutally along with most of his family members within a short time. “Now, the country is moving forward to fulfill Bangabandhu’s dream ‘Sonar Bangla’ under the leadership of his daughter Prime Minister Sheikh Hasina. The government of Sheikh Hasina has done a huge development in every sector,” he said. But, Mahmud said, a vested quarter does not see the development of the government rather it is now busy to destroy the country’s democracy. Chaired by actress and former lawmaker Sarah Begum Kabari, the discussion was attended, among others, by AL deputy publicity and publication secretary Aminul Islam Amin, AL city north unit general secretary Shahe Alam Murad, AL leaders Kamal Chowdhury and Akther Hossain, eminent actor ATM Shamsuzzaman, actresses Nutun, Aruna Biswas, Rokeya Prachi, Tarin and Badhan, singer SD Rubel and BSJ general secretary Arun Sarker Rana.